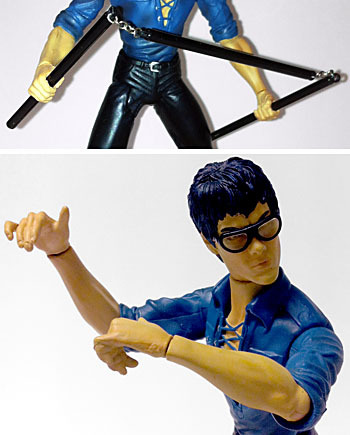 There have been several attempts at actual traditional Bruce Lee action figures over the years, and I'd say the all around best attempt has been Art Asylum's The Dragon Lives line from 2001. 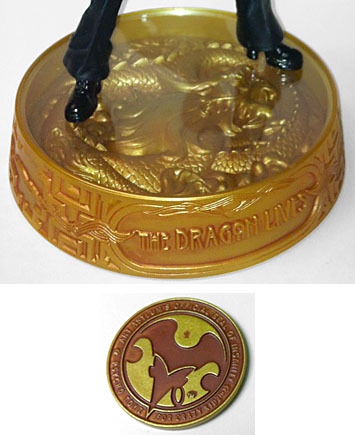 There were four figures offered in the line: "Brave Little Dragon" (aka Enter the Dragon Bruce), "Ascension of the Dragon" (aka Game of Death Bruce), "The Eternal Dragon" (aka, uh... Old Timey Bruce?) and "Hong Kong Dragon" (aka Casual Friday Bruce). I recently found Hong Kong and Ascension on eBay for pretty good prices, so I scooped 'em up to add some figural goodness to my Bruce display. The figures are somewhat exaggerated in their appearance. Not exactly cartoony, but a bit... Mezco-esque. This was roughly a dozen years ago, and sculpting hyper-realistic figures wasn't quite as much of a given as it is today. That said, both of the figures are easily identifiable as Bruce Lee. Hong Kong Dragon gives us a surprisingly unique look for Lee, somewhat hilariously based on clothes he wore in real life. The outfit consists of a blue lace-up collared shirt, funky tinted shades, bell-bottom pants, and yes, even platform shoes (although the figure's kicks are much more "high heel-y" than the shoes Lee actually wore). Hey, it was the '70s. Like the Ascension figure, we get some cartoony proportions, but a decent sculpt for the time. Lee's expression is stern, with the eyes visible behind the clear lenses of the glued-on glasses. The paint is pretty solid, if not spectacular. The head is well done, particulary the eyes. The hairline is clean. 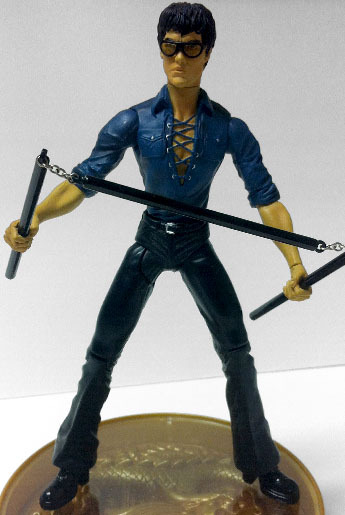 Hong Kong's pants are black, and his shirt is blue with a darker blue wash. His belt buckle, as well as the ringlets and buttons on his shirt, get silver paint apps. His platforms are glossy black. The skintone is nice, and there are some very subtle tone shifts on the arms and face. Hong Kong Lee's lips are particularly nice (again, not gay!). While most of the articulation works very well, there's one glaring issue. The only difference between Ascension and Hong Kong is the neck: the former gets a balljointed neck while the latter just has a peg joint. Considering how well Ascension's neck works, it's a shame his casual counterpart doesn't follow suit. That's not the main issue though. Aside from the neck, the figure gets peg and hinge shoulders and elbows, peg wrists, a sort of slanted peg waist, hinged hips, hinged knees, and balljointed elbows. The weird part is the hips. The right hip hinge lets the leg move forward and backward, like a typical t-crotch figure. The left hip hinge, on the other hand, moves straight out to the side, like... no figure, ever. It basically means that Bruce can only use his left leg for perpendicular side kicks, and no pose looks good except for a very wide legged stance or a crouch. It also looks awkward since the hip joints are asymmetrical, especially the prominent cuts on the yellow tracksuit. If you have a hinge like that without an additional peg joint at the hips, it really hinders the motion and limits the toy substantially. I'm not sure what AA was going for with this, but it's a common feature in their Dragon Lives line. By today's standard, these figures are very well accessorized. Hong Kong gets a very ornate golden base, with a clear plastic stand with a foot peg that attaches above a relief sculpture of a Chinese dragon. "The Dragon Lives" is emblazoned on the front, with a pattern inscribed all around the edge. The detail is amazing, but it doesn't stand out as well on the gold as on other colors. We also get a little plastic token, with a Yin and Yang symbol on the front, and the Art Asylum logo on the back. It's in folded over part of the ridiculously showy packaging, so it's easy to overlook, and I almost threw mine out. For actual accessories, Hong Kong Dragon gets a segmented three piece staff (with a real metal chain), plus an additional set of hands in addition to the regular grasping hands. Hong Kong Dragon's extra hands are both in a martial arts pose. The secondary market seems to want to demand anywhere from $40-$65 each for these figures, but I managed to snag two of them for $50 total, including shipping. The Ascension fig, which is definitely the better toy, was a bit more expensive, but it balanced out with the Hong Kong figure, which is much more of a novelty with its goofy duds, although still a cool piece of Bruce memorabilia. These may be the best you'll get in this scale, unless Hot Toys or Enterbay decide to break into the 6" market.